Ford, J R, Hughes, L, Burke H F and Lee, J R. 2015. 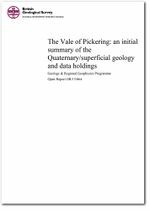 The Vale of Pickering: an initial summary of the Quaternary/superficial geology and data holdings. British Geological Survey Internal Report, OR/15/064. This page was last modified on 20 January 2016, at 17:41.